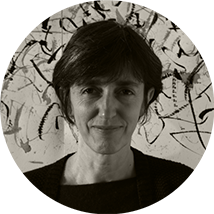 She has collaborated with Fondazione Musei Civici di Venezia and FAI - Fondo Ambiente Italiano. She is teaching calligraphy at Centro Internazionale Arti Calligrafiche - www.articalligrafiche.it and; in the past she also taught also at Academy of Art University - San Francisco, California - www.academyart.edu, Libera Università di Bolzano, ISIA in Faenza, Ca’ Foscari University in Venice. - Feel free to bring your favorite pens, inks and paper to draw and write letters with. Wednesday 5th and Thursday 6th of June. In this course we will develop written forms from real and imagined objects and from the sounds of voices and languages. We will also do a visual study of Oriental calligraphy. In the end all our studies will be standardized and reduced to recognizable alphabetical forms. All the works and the final alphabet will be assembled in a book. Printing and technology related to the design of typefaces have developed in the West and then in the globalized world. Typography has an ideological and symbolic role whose vast use has reduced, or sometimes completely erased, other registration modes of symbols and ideas, including writings from other cultures and our own handwriting. In general we can say that reducing writing systems to typographic writing systems is a form of colonization. The Western calligraphic tradition is directly and logically linked to typography. A respectful observation of other writing systems reveals other evolutions, other relationships between form and content, writer and writing, body gesture and trait. This is not the place to go into such a vast topic, but we can do exercises and games to help us guess the limits of typography. "A writing tradition scores, identifies and distinguishes a culture as much as the spoken languages, with which it overlaps and mixes”.